A cheap way to get that slice of Taylor renowned quality- the Taylor 110ce acoustic guitar gives you that iconic quality and tone in an affordable price. This guitar is made from selected wood materials, and crafted at a the highest quality possible, making it produce great tonal vibes into a smooth and silky acoustic voice that produces that loud and clear music. In this Taylor Guitar 110ce review, we are going to discuss its features that made buyers to give it a rating of 5 out of 5 stars. The Taylor 110ce is among the few guitars on the market that have features that are only found in guitars that go for a significantly higher price. The first of these is a solid Sitka spruce top which helps the guitar produce a brighter response and higher sound velocity when played. The back and sides are made from laminated Sapele, a rare wood that is also a standard feature in high-end guitars. While most guitars might brag of having Sapele as their primary material for the back and sides, not many can confess to using a high-quality version the tonewood. Its inclusion in the Taylor 110ce gives the guitar and smooth surface and also helps in increasing its sound quality. Other than these two advantages, Sapele is also known to be considerably durable due to its ability to withstand changes in humidity levels through the seasons. Guitars made from robust and high-quality tonewoods have more resistance when it comes to enduring the effects of constant playing over a period, as well as environmental changes. On the contrary, guitars made from laminated wood such as the Taylor 110ce have a significantly lower lifespan. Nonetheless, as the tonewood matures, so will the sound quality and the velocity at which it is projected. The Taylor 110ce also uses Sapele for its neck while the fingerboard and bridge use ebony wood. The guitar’s nut and saddle are made of Tusq, and Matte Varnish is used for the finish. Taylor utilized their unique drying process to ensure that the finish on this guitar is second to none and will remain on it for a long time as opposed to others which fade away easily. 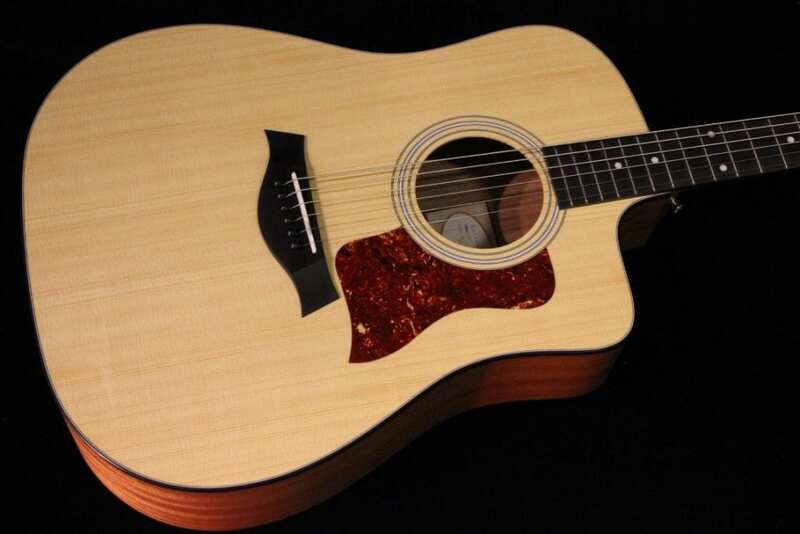 The Taylor 110ce falls under the dreadnought category measuring 20 inches long, 16 inches wide, and roughly 4 and 5/8 inches deep. As such, it is big enough for any adult to play comfortably and features a neck that is neither too big nor too slim. Thanks to its size, you can carry it anywhere you please comfortably without worrying that it will take up too much space. For such a guitar with outstanding quality, expect this to be an expensive one. Considering the materials used, the construction finishing processes, gig bag, and the Elixir strings that it comes with, I’d say this guitar is worth the price. The sound quality on the Taylor 110ce is unmatched for a guitar on its skill level. The materials used to enable it to give the player incredible response when lightly played. Still, it can be louder and still bright when played more vigorously with zero distortion to the bass, mid or treble. The Taylor 110ce is a perfectly balanced acoustic guitar with excellent sound quality. Whether strumming or plucking, the Taylor 110ce produces Taylor-standard quality sound with the perfect acoustic projection and tonality. Laminated Sapele, which is also used in Cadillac custom interiors and exotic wood flooring enables the Taylor 110ce to produce quality sound in the mid and high ranges. Nonetheless, it is the patented x-bracing system and the size of this guitar that increase its sound projection compared to other models. There is a specific way that Taylor guitars are supposed to sound when played. The solid and comfortably shaped sound can be felt whenever someone plays the Taylor 110ce. It has all the qualities of a natural guitar with the softest laminate to prove that fact. Its action is also unlike most guitars within its price range, low enough to produce quality sound while avoiding any dead notes or buzzing when the strings come into contact with the frets. The Taylor 110ce has incredible resonance and a balanced feel that is reflected in its sound quality. When played, it clearly rings through treble tones to give the room a bright sound. Positioning it is easy and seeing how smooth the guitar feels, comfort while playing is guaranteed. It is an exceptional acoustic guitar for a beginner as it is easy to play and comes with features a player will see in many professional-level guitars as their skill matures. A versatile guitar that can be used in various genres. Has a great pickup and a quality preamp. The guitar is not entirely composed of solid wood because of its layered laminate back and sides. Still considered as an expensive guitar compared to others. The Taylor 110ce is a household name when it comes to high-quality beginner-level guitars. Then again, what would you expect from Bob Taylor? A sweet, crisp tone mixed with an eye-catching design only compliment the rich and quality sound the Taylor 110ce produces. Not to mention, considering all the materials and features that this guitar comes with, the price it goes for is substantially low.